You will thoroughly enjoy the newest free graphic design package we’ve created for you. 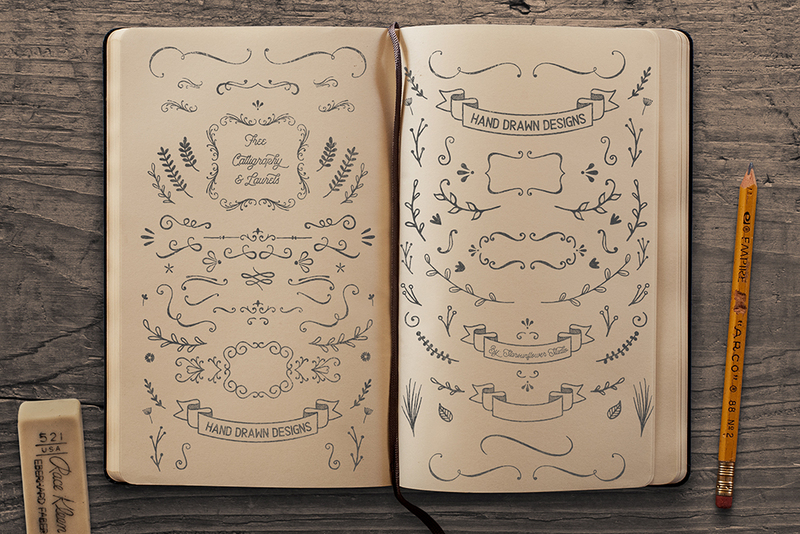 These free laurels and calligraphy vector shapes are so amazingly versatile. You can mix and match them to create wonderful logo designs, wreath designs and even work great for invitations. There is a stock vector you can use in Adobe Illustrator, Inkscape (free) or Corel Draw. You get PNG clip art and then for Photoshop there are custom shapes and brush presets included. You’re welcome Brenda! Glad you like them. Thank you so much for these. They’re fantastic! If I use these in cards to be sold commercially, do I have to provide a link?? Hi Wowe. Yes you can use these for making cards to sell. A link back is not necessary. Enjoy! You’re welcome Suzanne. Glad you like them! Thank you! Thank you! Thank you Oh, and thank you! I am making some tea towels for family Christmas gifts and this exactly what I was in my head for laurels. You are awesome! If I ever do post anywhere I will be sure to credit you. Thanks again! Aww glad you can use them for your Christmas gift project! Yay. Thanks for the comment. i have downloaded them but I don not Adobe and am not sure how to use them?